Regensburg (heinnews) – Basketball’s world ruling body FIBA was asked by its member nations for guidance on a number of issues, including the world community’s relationship with the NCAA, player buyouts for NBA teams and the transfers of minors. Those were some of the issues addressed during the workshops at the FIBA Mid-Term Congress in Hong Kong. It was also disclosed that there is a kind of thank you ceremony planned for England, Scotland and Wales after relinquishing their member rights in favor of Britain; and the International Basketball Foundation is discussing a new project in Asia having to do with refugees. 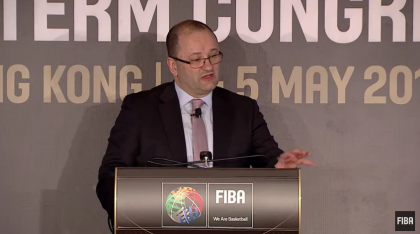 FIBA Secretary General Patrick Baumann discussed the conclusions of four workshops the FIBA members went through during the congress. He said from the “Building the national federations standards development pathway” workshop, guidance from FIBA was asked in a couple of points. The Uganda basketball federation president Ambrose Tashobya addressed a concern he had that had not been discussed in the breakout sessions – namely having players with dual nationality decide when they are 16 years old for which country they play. “Later on when they grow up they want to choose a country to play for, maybe a country where their mother or father come frome but they cannot play. It becomes limiting and a challenge to the federations,” Tashobya said. The Ugandan basketball head said he wished the decision age could be pushed back to 20 years. Baumann answered in saying that the issue has been debated within FIBA on a regular basis. He mentioned also that there should be a stronger link between the player and the country which developed them. “One has to understand that it’s about creating a link, not only about a passport with a country but also making sure that you develop talents in your own country. Whoever represents you at a national team has actually gone through your own basketball school in your country and isn’t a product of a basketball school of another country,” Baumann said. Even though the Ugandan president did not ask about a second naturalized player, Baumann added that the FIBA Board has always agreed that one naturalized player is enough. “On a court with five players, if you start changing that rule you suddenly have a second naturalized player authrorized this will dramatically change the dynamic of the game,” Baumann said. 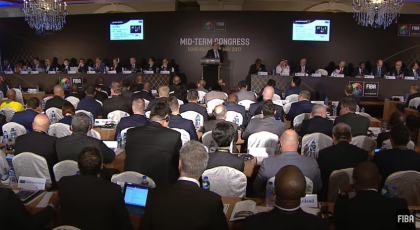 The FIBA Mid-Term Congress also featured the International Basketball Foundation giving a report on recent events. The IBF director Florian Wanninger said the organization is discussing a new project with the executive director of Asia. “We should address the issue of the refugees in one of the most affected countries in the region. We have no project in Asia right now, and I think we should have one,” Wanninger said.